In order for people and cats to coexist harmoniously, having a bit of personal space is a necessity. Assuming you don’t want your cat to mark your luxury sofa as their property, it’s wise to invest in a more appropriate piece of furniture specifically intended for your cat. A quality cat tree may very well be the most expensive purchase you make for your cat. 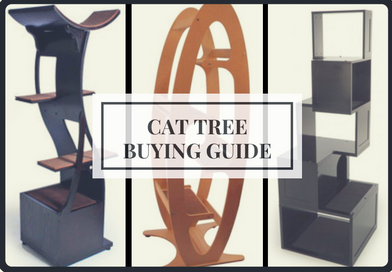 In most cases, it’s better to think of a cat tree as an investment in the future of your home furnishings. In that regard, a cat tree is just as much for your benefit as it is for your cat. 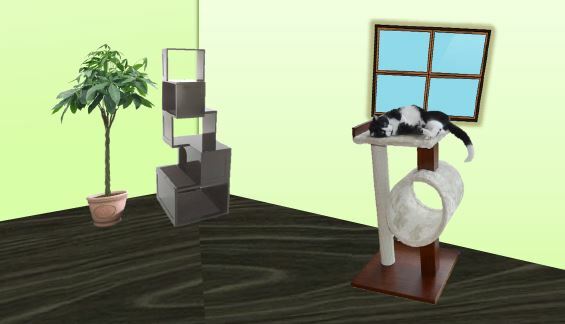 You can basically group cat trees into 2 main categories based on the material with which they are made. Carpet cat trees have been the norm for several decades. Our definition of a carpet cat tree includes any cat tree that is predominantly covered in carpet. 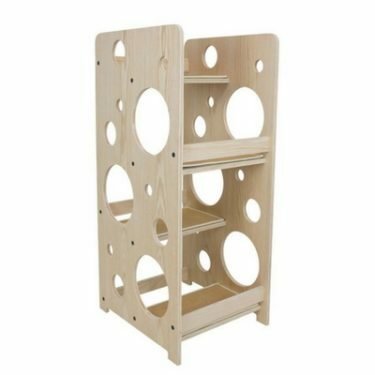 The newer, more modern cat trees are made of wood, or manufactured wood. Most wooden cat trees have some type of carpet or fur material on select areas for lounging, but the majority of the exposed areas are wood. When most people think of cat trees they think of carpet-covered jungle gyms for your cat. And if you’ve been to any pet stores over the years, carpet cat trees are pretty much all you’ll find. Even though carpet is the most widely used cat tree material, we highly recommend you avoid these cat trees at all costs. Cat trees are supposed to be enticing for scratching and playing. If your cat is encouraged to scratch their carpeted cat tree, why wouldn’t they also be allowed to scratch your designer rug? You could unintentionally be training your cat to destroy your furniture if you get them a cat tree with similar materials. Not to mention, carpet cat trees don’t hold up very well and they make a huge mess when they become shredded. Wood or manufactured wood is a much better choice for cat trees than carpet. Not only do wooden cat trees look nicer, but they’ll also hold up much better over time. Cats don’t tend to abuse wooden furniture the way they do with carpet or other plush coverings. That’s why it’s a suitable material for cat trees. The downside of wood is that it can be slippery and have sharp edges. But a well-designed wooden cat tree will address these safety concerns. Now that we’ve narrowed down our options to exclude carpet cat trees, we can look at some specific design considerations for your cat. In general, cats like to be up high. Being up high gives them a sense of security and allows them to keep an eye on everything that’s going on. Choosing an appropriate height for your cat tree is a very important consideration. But with height comes instability. In order for your cat to feel safe climbing their cat tree, it must be reasonably stable. And lastly, you’ll want to make sure the cat tree is appropriately sized for your cat or cats. Whether you have a kitten or a bunch of fat cats, choosing a cat tree that fits is crucial. Generally speaking, higher is better if you ask your cat. But maybe you already have cat shelves or a cat walk, and all you really need is a window-height cat tree. Think about where your cat tree will go. Some cats would prefer a low cat tree with a view out the window over a tall cat tree in the corner of the room. Owners tend to worry a lot more about cat tree stability than their cats. Most cat trees are designed with relatively small footprints compared to their height. If you have rambunctious cats jumping on and off the cat tree, there will definitely be some degree of wobbliness. If your cat doesn’t feel safe on the cat tree, it won’t get used. 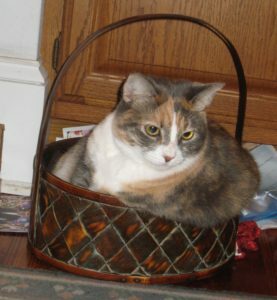 Have you ever been surprised to find out that your fat cat is able to fit into the smallest crevices? A lot of cats actually like small confined spaces. What they consider comfortable might not make any sense to us. If you’re looking for a cat tree for your kitten, don’t be afraid of going big. It’s better to invest in a quality cat tree that your kitten can grow into rather than getting a kitten tree that’ll be worthless in a couple of months. If you have a large-framed cat or obese cat, you’ll want to make sure the cat tree has large enough openings and adequate space for lounging. 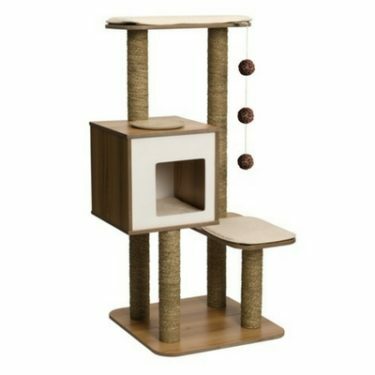 Our top-rated cat trees for large cats are The Refined Feline Lotus Cat Tower and PetFusion Modern Cat Activity Tree & Scratching Post. A cat tree or cat condo is really just a piece of furniture that your cat can call their own. Some cat trees are fancier than others. At the very least they should include steps or ledges for climbing and an area for lounging. Going a step further, we like to see cat trees that incorporate scratching posts or scratching pads. Scratching is an integral part of cat behavior and why not have a cat tree that includes this feature? Some cat trees have cubbies or small enclosures for hiding. And others even have built in toys. The options are endless. Cats spend a majority of their time sleeping. 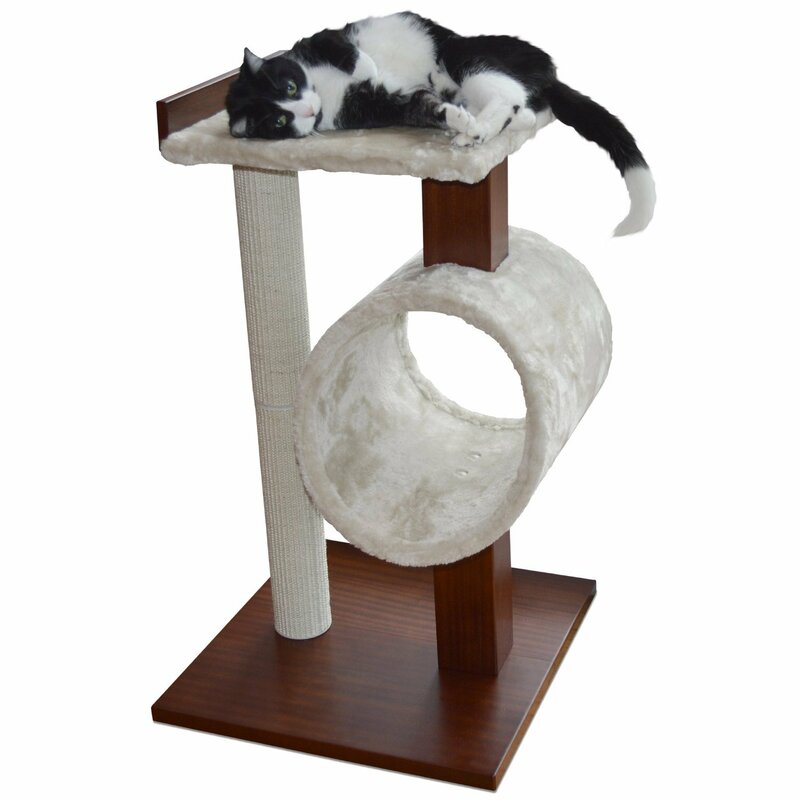 It makes sense that the ideal cat tree would accommodate your cat’s favorite pastime. The best lounge areas are often placed at the top of the cat tree. In multi-cat families, the top perch is typically the most sought after spot on the cat tree. Lounge areas can be open platforms or partially enclosed. Pay particular attention to the fabric or material that is used in these lounge areas. Ideally it should be soft and inviting, but easily differentiated from your personal furniture coverings. 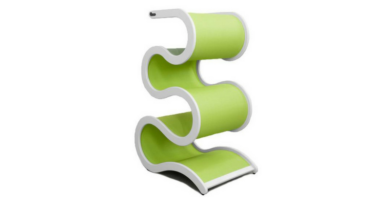 If your cat is fond of scratching, like most cats, having multiple cat scratchers is highly recommended. So even if you already have a scratching post for your cat, it’s still very beneficial to find a cat tree that also has this feature incorporated. Scratching is one of the ways cats will mark their territory. A built-in scratcher will increase the likelihood that your cat will take ownership of the cat tree. Sisal scratching posts are ideal because they hold up much better than carpet or cardboard. 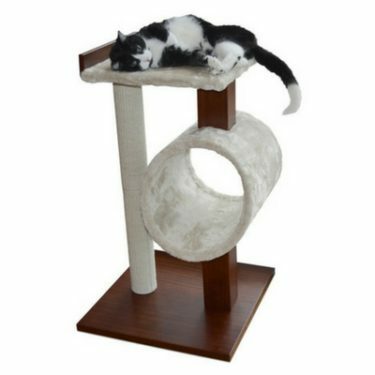 The scratching post should be large enough to enable your cat to fully stretch out while scratching. Some cats like to hide and others do not. 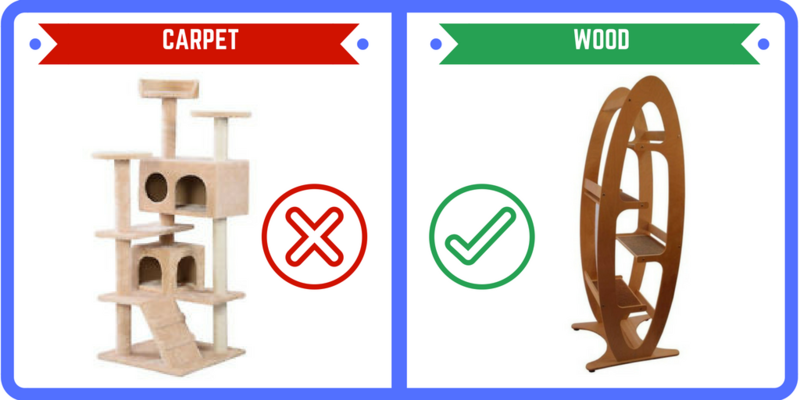 Your decision on whether or not to find a cat tree with a cubby should be based on your cat’s preferences. The ideal cubby should have a large enough opening (we recommend 10”). 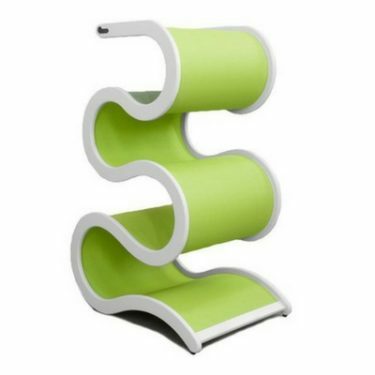 There are a few cat trees on the market, primarily made by Vesper, that incorporate cat toys into their design. On the one hand, built-in toys are a cat-friendly feature that might help entice your cat to use their cat tree. On the other hand, cat toys that are left out tend to get destroyed quickly or ignored. On top of that, built-in cat toys generally detract from the appearance of the cat tree. So once again, this will come down to personal preference, but we tend to think the toy feature is unnecessary. 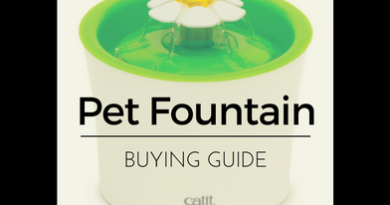 Now that we have all the bases covered for your cat, it’s time to see what owner-friendly features the cat tree manufacturers have included. We’ll look at aesthetics, the assembly process, and any features that will facilitate cleaning and maintenance. In our article, Modern Cat Furniture to the Rescue, we introduced some of the top brands for modern cat furniture. If you are going to purchase a cat tree that you expect to last 10+ years, why shouldn’t it be held to the same criteria that you use for selecting the perfect living room furniture? Yes, the cat tree is for your cat, but you might as well find an attractive one if you’re the one who will have to look at it every day! Most cat trees require some degree of assembly. The process can take anywhere from 10 minutes to well over an hour. To some extent, this will depend on your level of handiness. 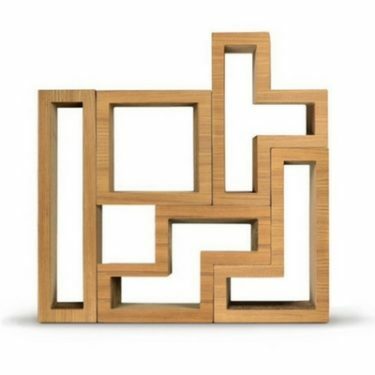 But even an expert handyman will struggle with poor instructions and pieces that don’t line up. Make sure to read our detailed reviews so you know what to expect. 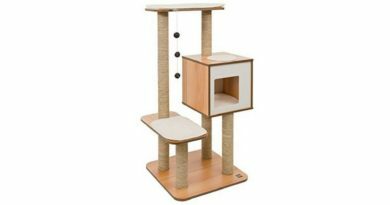 The cat trees that were the easiest to assemble were the PetFusion Modern Cat Tree and the KATRIS Modular Cat Tree. 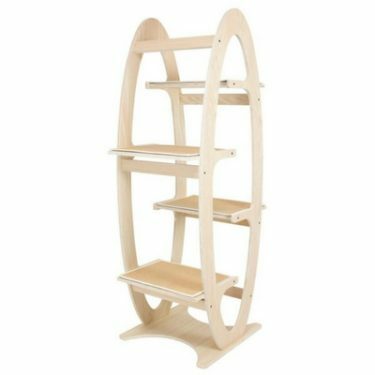 On the opposite end of the spectrum, the Sebastian Modern Cat Tree and Vesper V-High Base proved to be the most frustrating to assemble. Cleaning your cat tree is probably not something you’ve given much thought to, but it is worth noting that some manufacturers are leading the pack with maintenance-friendly design features. The Lotus Cat Tower and the Vesper V-High Base have Velcro cushions and carpet that can be easily removed, washed, and replaced. Additionally, the Lotus Cat Tower has a replaceable scratching pad. 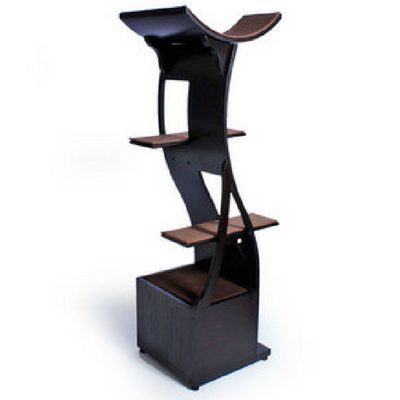 Our top cat tree is The Refined Feline Lotus Cat Tower. 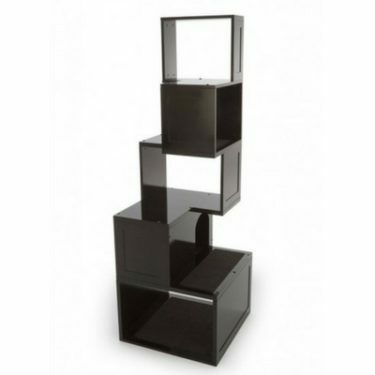 The beautiful modern design, quality construction, kitty-functionality, and owner-friendly features put the Lotus Cat Tower above the competition. Read the full review here. 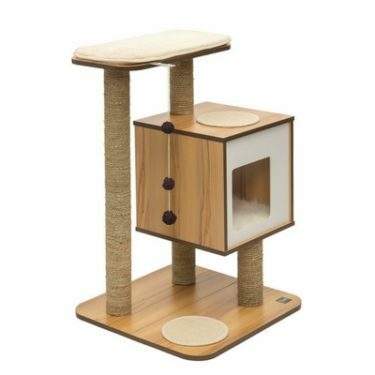 The PetFusion Modern Cat Activity Tree & Scratching Post is the runner-up for best overall cat tree, but at less than a third of the price, we thought it deserved its own category. 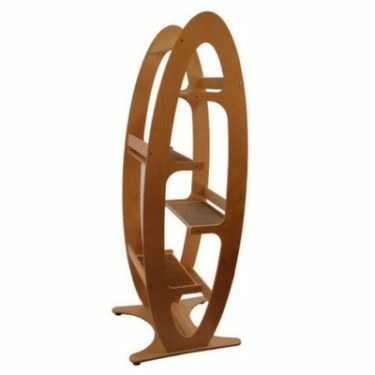 This cat tree is attractive, excellent quality, and it also happens to be one of the most affordable cat trees on the market. Read the full review here.